On December 1, 1997, President Clinton signed Public Law 105-124, 50 states Commenmorative Coin Program Act, authorizing the U.S. Mint to issue a series of circulating quarter dollars to honor each of our country's 50 states. The new American quarters will be minted in the order in which each state retified the Constitution or entered the Union, five quarters every year from 1997-2008. 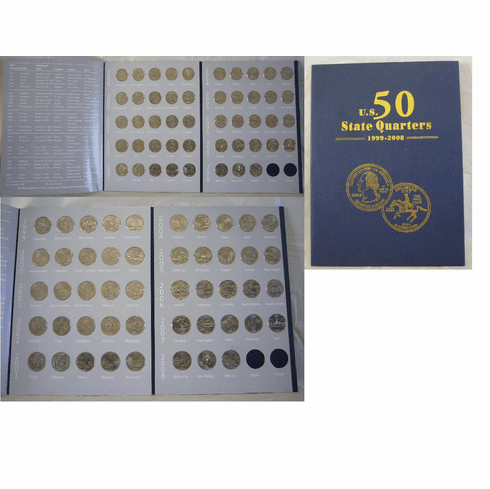 This hardcover quarter folder for all 50 states and opens flat for all-at-once viewing, also included 48 quarter dollars. We remain two quarters space let you enjoy the fun of collection!